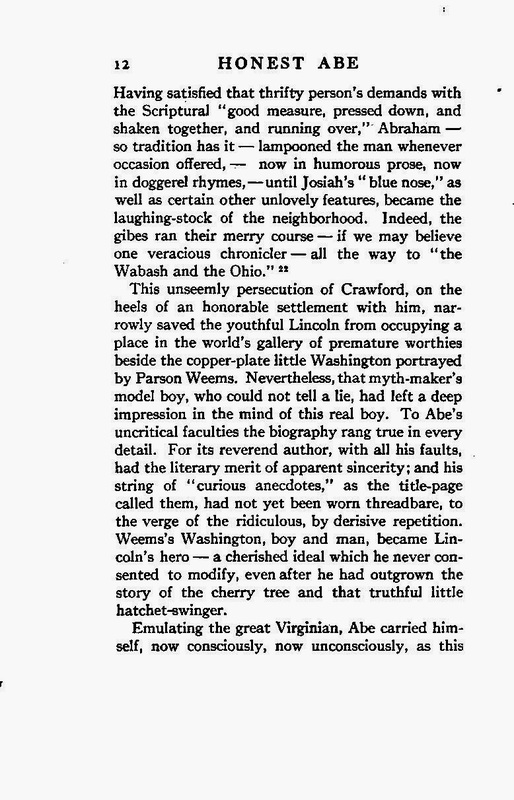 This flows naturally from last week's discussion about the possible mythical role of Betsy Ross creating the first U.S. flag and Parson Weems's creations of American myth like the tale of George Washington and the chopping of the cherry tree. 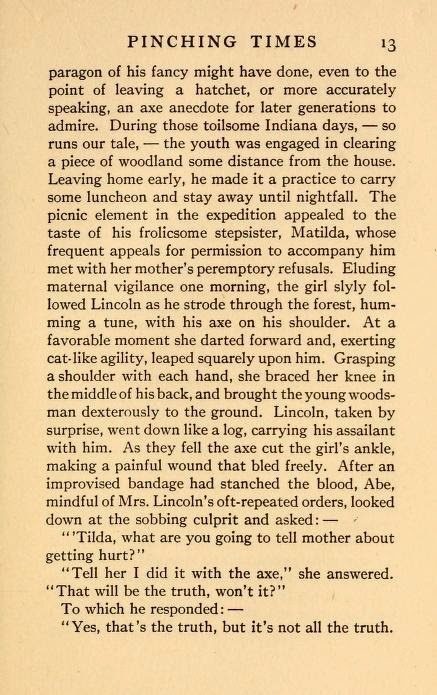 This was a great look at the early way Abraham Lincoln managed to use storytelling. 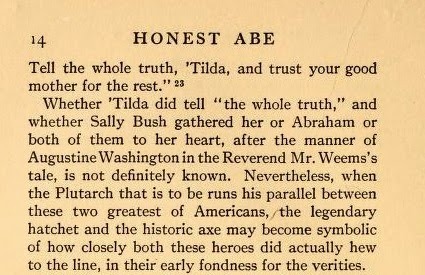 If anyone wants to look at the footnotes in this story or read more about "Honest Abe"; A Study in Integrity Based on the Early Life of Abraham Lincoln by Alonzo Rothschild, the entire book is found online at Archive.org where they, too, are Keeping the Public in Public Domain. 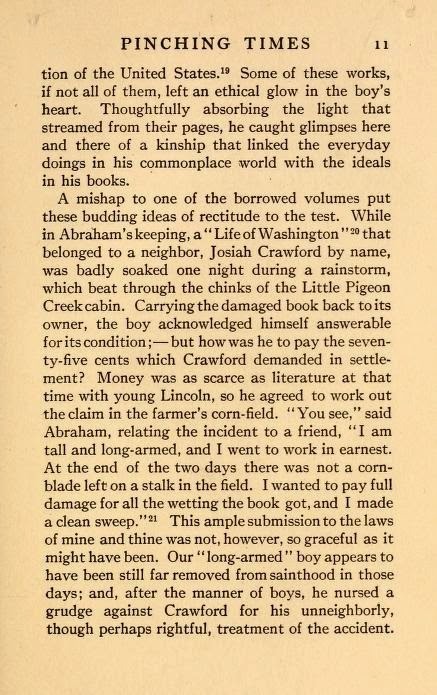 To my mind Rothschild certainly beats the original Childhood of Famous Americans series, published by Bobbs-Merrill in the 1930s through the 1950s and still in many libraries when I began to work as a librarian. Still I know they were beloved in their own time and someday will be Public Domain, too. For now, if you really want them, they're in many an antique store, and they are a look at literature of that period...always something to keep in mind when evaluating a story. Former English teacher and now homeschool teacher, Juliette Holden, reviewed the new version of the series in her blog, Jane Austen Mama. As the mother and teacher of a child with visual difficulties that might have also been labeled a learning disability, she values the new series. As she points out, "Each biography focuses on a childhood incident in the famous American's life which is not only true but also applicable to something memorable in their adult life." It's interesting that the first example she gives is of a young Betsy Ross and her thimble, learning to be true to her own interests and talents." I confess I was a bit shocked to find some of the new series in our church library's children's biography section. 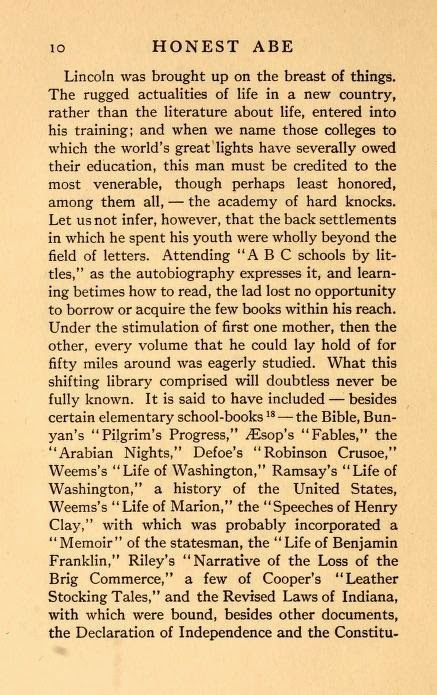 Clearly they still teach values, but my only caution would be to remember the level of fictionalization. 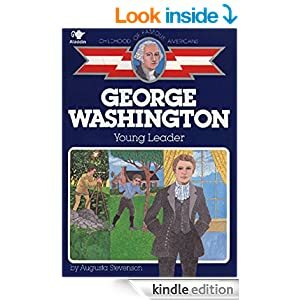 Going on Amazon for reviews, at present, all rate George Washington: Young Leader from the series positively, but the four star reviews note the need to recognize the fictionalization. 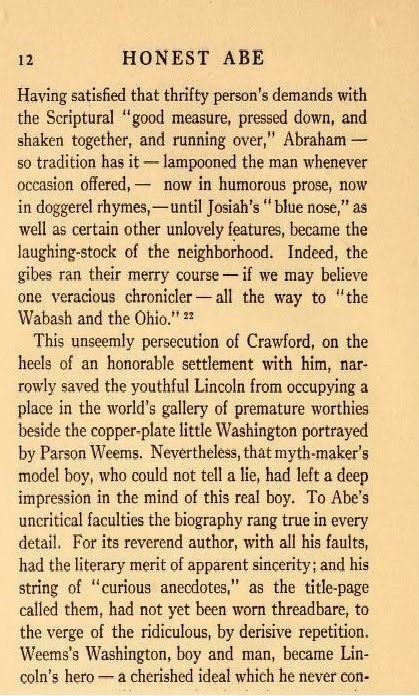 Still I notice that, even though written in 1942 and repackaged and newly illustrated, it avoids the Parson Weems tale of that bothersome cherry tree. Since Betsy Ross's book is about her childhood, we don't even have to consider if she truly made the first flag or not. A story, however, can be "true" even if it isn't factual. Hmmm. Looks like those issues Rivka raised are still with us. Come back next week for the final look, for now?, at American myths that have been waving like the flag on Independence Day.